Grease a medium sized oven dish with the butter. Add a layer of mincemeat in spoonfuls on the base of the pan. 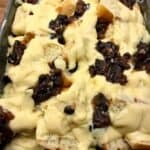 Layer the brioche slices on top of the mincemeat. Add in more spoons of mincemeat. Pour on the custard, covering as much of the ingredients as possible. Add a few more spoonfuls of mincemeat on the top. Bake at 180 degrees for 30 mins, until golden brown.